Have I mentioned how much I like Mark Bittman? The New York Times food writer, blogger, and star of many cooking shows on public television, has a down-to-earth approach to the kitchen, and a firm grasp on what is or is not doable for the time (and technique)-challenged home cook. I had printed out and saved his recipe for Simple Paella many years ago. When I went though my long-neglected recipe files a while back it surfaced, and I set it aside, along with other paella recipes, for the day I worked up the courage to try making the dish at home. I had bought a paellera (paella pan), but not yet used it, so last weekend I got it out, along with the Bomba rice (Spanish short grained somewhat like Arborio) I’d bought at Wegmans. But then I realized that I needed to season my new pan, since it is carbon steel, much as you season a new cast iron pan: brush with oil, and bake, repeating once or twice. Then I noticed Bittman’s recipe that recommends using a cast iron pan, which I had at the ready. And it was well suited to my situation of having a stove and oven, no outdoor grill, much less a wood fire. And it was quick, a few minutes on top of the stove to sauté the onions, then add all the other ingredients, and bake in a very hot oven (500°) for 25 minutes. I used chorizo, shrimp, and littleneck clams, along with some stock I made last summer by boiling lobster shells after a feast. The results were amazing, right down to a little of that desirable stuck on crust of rice in the pan! Why did I wait so long? I will be doing this over and over again, as I try out all the variations that appeal to me, but I know that seafood and chorizo will always be my favorite. Try this soon, and if you have company, this will let you spend plenty of time with them yet still serve a dynamite meal! 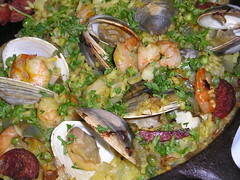 Faith – Brava for you for finally making the paella. It looks delicious. I am not crazy about mixing sausage and seafood, so leave out the meat when I make my seafood risotto, which is very similar. I cook the shrimp shells in water to make a stock, similar to your more elegant lobster stock. Thanks Linda – I plan to eventually try the “original” version with rabbit and snails, too!